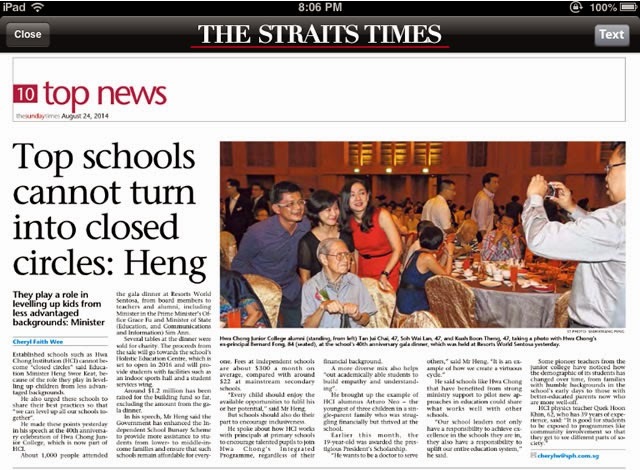 It was only the Education Minister speech to HCI 40th anniversary dinner. It was also a speech not to be taken too seriously, a wishful speech which alumni of the top schools and the government do not want badly enough to rectify. Such closed circles are cozy corners for winners. We don't know and really don't want everyone to be winners but that is not politically correct to say so in public. So I wished Heng Swee Keat never made this speech. There are so many other topics he could use, why this one when you and the government do not have enough political will or courage to fix? This is yet another credibility losing speech, and this guy could is a potential PM. How can we not feel a little sad for the future of this place? But this problem will be fixed when it is very late, on pain for losing elections and the solutions will be bad band aid measures. In other words, it will be like what 'good' government elsewhere would do. In future, some of them visiting us will say in private to our leaders, "I thought you had it all sewn up, what happened? Why did you ape us? For a long time we will trying to copy you without success"
What is the hard truth here? I am sorry it had to come from LKY again. As I understand it from LKY, such closed circles are inevitable and there is nothing you can do about them. If you don't want them then don't even let them happen. We would also have to accept a materially poor society and on top of it we will also have little control over our fate as we get pushed around by others. Politics is the art of the possible. Unfortunately people cannot think in counterfactuals and the present leaders lack the confidence and courage to even try. Yet on the other hand they foolishly sometimes publicly scold us when they never earned the respect and right to do so. That was really dumb especially coming from the PM. Only Tharman was wise enough to avoid this. Can we stop these closed circles? Yes, but only very slowly with results achieved over decades, not unlike our bilingual policy. Sadly today's government are actually too short term to think and act by the decades horizon. Long term thinking is increasingly only our branding, it is getting less real every year as the PAP worry more and more about how to win elections. Yet the Singaporean way to win elections is not to worry too much about them but to do what really matters for the long term. We are probably the only electorate in the world that is smart enough to understand this. If we did not, would we have supported LKY from the beginning? We would have gone Communist. Sure but there is no need to attribute it to me or this blog unless you find it helpful to you. Blogging for myself I am not interested in traffic. Not sure we are going down the wrong road - and I hope it is not just for being "popular" Diluting institutions accused of being "closed circles" will result in an average - and hopefully not on the lower scale of 0-10. It was the right road until the majority of people lost hope trying to get into these top schools whereupon they will work to bring down the system. We mustn't let that happen and I am suggesting there is no quick fix to this issue except one that takes many electoral cycles to solve. However if we fail to resolve this the consequences would be dire. On the other hand some pressure relief is appearing in the guise of ASPIRE which hopefully can dissuade a few more from aspiring to such schools. We gotta help more and more people realize you do not need to be 'successful' to be happy. Successful graduate parents give government the greatest pressure wanting to get their kids into these few schools. It is every parent's wish to get their kids to do better than them. We are also becoming a society with many graduates. This pressure will keep building. Yes, those who badly wanted to be graduates but somehow failed often try even harder by vicariously living their ambitions through their kids. Getting into these top schools is a form of security. I agree often it is likely parents who are driving their kids into the top schools when clearly the children are not up to the mark - for various reasons. To satisfy such parents' ambitions (often driven by selfish personal goals) will dilute the quality of the top schools. It will bring down the quality that marks "top school calibre" and clearly, the average is not going to help the country. Let the kids discover their talents - I came across recently a young graduate who's now in the finance profession and she loathes her job and still dream of pursuing some other artistic vocation - all because her parents were in the finance space. She also spoke the same for her brother. I pity them - and the parents more, for the latter have really failed to help the children develop talents what they best geared for.